At 3:00 PM eastern time on February 21, the trade deadline for the 2012-13 NBA season halted all transactions between teams until the summer. Basketball fans were on the edge of their seats all day, just waiting for a “Woj Bomb” (a tweet by Yahoo basketball reporter Adrian Wojnarowski) that rocks the basketball world. Let’s dive into what the biggest winners and losers of the trade deadline were. Houston Rockets: General manager Daryl Morey is at it again. One of the earliest trades of the deadline sent Patrick Patterson, Cole Aldrich, and Toney Douglas to the Sacramento Kings and sent young forward Marcus Morris to the Phoenix Suns. The good news? They were able to bring in Thomas Robinson, the strong and athletic rookie from Kansas University who was drafted fifth overall in the draft last summer. Robinson hasn’t earned the opportunity he deserves in Sacramento, and with Patterson and Morris moving out, he’ll have a great chance to shine in Houston. As a Kansas Jayhawk, Thomas Robinson averaged 18-12 on 51% shooting. Although he doesn’t have elite length, he’s able to succeed under the basket as an excellent rebounder due to his strength and fundamentally-correct rebounding techniques. In this trade, the Rockets also brought in Francisco Garcia, yet another player that specializes in three-pointers and defense that fits perfectly in the Rockets system. Also acquired by Houston in this deal is Jimmer Fredette’s bench buddy, Tyler Honeycutt. That’s pretty sad, I guess, but the rest of the trade was exciting from Houston’s perspective. Los Angeles Lakers: As a Lakers fan, I actually approve of the lack of moves on their part. Dwight Howard is still only 27 years old. Despite being banged up with injuries this season, he’s put up numbers that for anyone else in the NBA, you’d go, “_______ is really having a productive season. He’s scoring efficiently and rebounding at a high rate.” Howard has higher expectations, but hasn’t really fallen too far short of them, except on the defensive end, where he’s improved in the last few games. I also feel like the Pau Gasol injury may have been a blessing in disguise for the Lakers, who would have contemplated dealing him had he remained healthy. If there had been a trade for Gasol, given his recent play this year, the Lakers wouldn’t have received a return package of the same value as Gasol. It’s almost never a good idea to seek a trade when a player’s stock is that low. You can click on the images to view them closer, but if you had to choose one, I’m sure that you would choose the one furthest to the right. The one furthest to the left is the shot distribution of Monta Ellis, who currently takes the MOST shots on the Milwaukee Bucks. The one in the middle is the shot distribution of Brandon Jennings. It doesn’t seem too bad at all, until you zoom up and see that he is shooting 43.5% from under the basket, good enough for last among qualified players from inside 9 feet. And the one on the right is the newcomer. JJ Redick. Do you see why it is so important that he takes shots away from these two ball-hogs? Assuming that it helps their team’s putrid balance, this is a great move for the Bucks. Boston Celtics: The Celtics have been imitating the Portland Trail Blazers the last few weeks. Rajon Rondo and Leonardo Barbosa both were lost for the season with ACL tears. Their back-court was left in shambles. the Lakers on Wednesday, the Celtics were depleted at the guard position so badly that they were left with three guards on their line-up. Jason Terry, Courtney Lee, and Avery Bradley. So when the Celtics went out and were able to acquire Jordan Crawford for just the price of the injured Barbosa’s expiring contract and the little-used Jason Collins, it seemed like a no-brainer. Crawford is known for taking too many shots and is much criticized for his decision-making. Hopefully for Boston, the veteran leadership will be able to guide him to a wiser overall game. I believe he’s talented enough to make a major contribution to this team if he’s able to do these things. Portland Trail Blazers: The Trail Blazers agreed to a deal with the Oklahoma City Thunder that brought in point guard Eric Maynor for a second-round draft pick. Maynor, a fourth-year player out of VCU had rarely been used in OKC this season after missing the entire previous season with a knee injury. In his first two seasons, Maynor showed tremendous promise. He was a solid three-point shooter and a tremendous passer. In his college days at Virginia Commonwealth, Maynor was a ball of excitement in the Colonial Conference. The last couple minutes of one of the VCU Rams games with George Mason may have been the greatest thing ever. For a Portland bench that scores 9.2 points fewer per game than any other team and are the only team since the 1997-98 season (the limits of my source) to score less than 17 points per game, this move makes a lot of sense. Maynor is able to create for himself a little bit, but specializes as a floor general and will be able to create for others when he is out there. The only concern with this move is that Maynor is coming off of an ACL tear, something that Blazer players have become almost synonymous with. Sacramento Kings: The Kings were sitting at the bottom of the Mariana Trench, the lowest abyss in any ocean. So many bad situations have put this franchise into a situation where you wonder if they can go any lower. Suddenly, whilst sitting at the bottom of the lowest trench in the world, the ocean floor crumbled beneath them and they fell another 5,000 feet nowhere and unable to see any sign of daylight anywhere. While I’m not sure whether or not that metaphor came across or not, the point is this. The Sacramento Kings are a freaking disaster. Dysfunctional ownership has left the team in a scramble to harvest all possible cash to prevent the franchise from relocating to Seattle. At the trade deadline, the starve for money led to the team trading away their fifth overall pick and their future, Thomas Robinson. I understand that it saved them $3.1 million in a time where they need to accumulate cash, but still. In the long run, this will likely make them more bankrupt. Although they earn money in the trade, they lose money in advertising, ticket sales, and merchandise sales. What fan wants to stand by an organization that just admitted to throwing away their future? They hardly got any value at all in return. Toney Douglas is basically a twelfth man. Cole Aldrich, too. Patrick Patterson is a rotational player and has probably already peaked. He’s far less valuable than Thomas Robinson’s immense amount of potential. The Maloof family should be embarrassed to own a franchise this way. Utah Jazz: None of the other “losers” of the deadline can quite compare to the atrocity of the Sacramento Kings, but the Utah Jazz certainly did themselves a disservice. The Jazz needed to make a deal. They’re sitting at the seventh spot in the west, with the talent-filled Lakers occupying the ninth spot, eyeing their playoff spot. Paul Millsap and Al Jefferson are both on expiring contracts and both valuable. The Jazz have a notable weak spot at the point guard position and talent like Eric Bledsoe was on the market. Their front-office has a long history of making the right decision, but at this trade deadline, I feel like they made the wrong one. Salt Lake City isn’t always a desirable place to spend a winter and they had a golden opportunity to get talent in return for one of their big men before they may walk during the free agency period this summer. Atlanta Hawks: THEY HAD TO TRADE JOSH SMITH. He may have a problem with heaving too many jumpers and sometimes he may not seem like he’s totally “in” the game, but he still is a very athletic tweener forward that has value on many teams. I think he will walk away this summer anyways. Take it from the Cavaliers. It isn’t fun when you watch a star player walk away with your team getting nothing in return. Don’t get me wrong–Josh Smith isn’t nearly the player Lebron James is–but the two situations are relatively similar. They could have sent Smith to San Antonio and received Dejuan Blair and Stephen Jackson in return. Maybe they could have also been able to pry Bledsoe away from the Clippers and fill the void left on the bench when Lou Williams went down. Maybe even the Lakers would have bitten if they tried hard enough to get Dwight Howard. The Hawks intend on making an effort to draw in Howard, who grew up near Atlanta, during the summer. It would have gone a long way towards completing that signing if they could have made him a Hawk now and familiarized him with his teammates and the organization. The NBA season is not even a month old, yet a bunch of important things already happened. The Lakers have used three coaches. The Thunder broke up their core. The Clippers, Grizzlies, and Knicks have put their names into the contender basket. Andrew Bynum hurt himself bowling. We’ve had a 3-overtime game and one night with four overtime games. The Wizards have won a ga… no that hasn’t happened quite yet. But it almost did! Anyway, even though it would be dumb to make any conclusions about anything meaningful 10-12 games in, we’re far enough into the season to ask questions about things that have stood out or changed from our expectations. So I decided, on this wonderful Thanksgiving day, to take a look at ten notable nuggets from the beginning of the year. The secret to Milwaukee’s high-scoring offense is that it’s not actually great at all. But the team, which in the not-too-distant past played at a snail’s pace, suddenly leads the league in pace by over a possession per game. Milwaukee averages over 101 points per game (good for 6th in the league) but is just 16th in offensive efficiency. It makes sense to run faster, with lightning quick guards Brandon Jennings and Monta Ellis leading the way. But no one knew just how quickly Milwaukee would move up and down the court, especially since Scott Skiles has the (rightfully earned) reputation of a defensive coach. Also, Milwaukee’s off to a decent 6-4 start despite not getting anything from their starting frontcourt in most games. Ersan Ilyasova may have picked up Andris Biedrins Syndrome during the summer, as he somehow lost his jumper and all his confidence over the summer. His starting job may be in jeopardy, especially if John Henson plays anywhere near as well as he did against Miami. If that happens, look for even a quicker pace going forward. The Knicks finished last season with the most turnovers per game of any NBA team. Linsanity had something to do with that, but not everything. So now that the Knicks have committed the fewest turnovers per game so far this season, you have to wonder whether this will hold up. The answer: not likely, but they should remain among the best in the league in protecting the ball. They currently average 10.7 per game, which would be an NBA record. But with an offense predicated on iso-Melo and a bunch of shooters who (mostly) know their roles, the team will certainly be hard to turn over. Jason Kidd rarely makes bad decisions, Melo rarely passes (kidding – despite his low assist numbers, all indications are that he has passed effectively), and none of the players are turnover fiends. We could also talk about the shooting and rebounding, but that’s a topic for another day. The reversal in turnovers would be unprecedented, so that’s something that deserves watching. The Blazers bench is, well, something horrid. So Terry Stotts hasn’t used it much at all, setting an alarming rate for his starters’ minutes in a year in which wins likely won’t mean much for the team down the road. Portland’s front four (LaMarcus Aldridge, Nicolas Batum, Wesley Matthews, and Damian Lillard) are each averaging 37+ minutes per game, which puts all four in the top 16 in the league in minutes per game. Only Meyers Leonard has played every game among non-starters, with Stotts’ rotation changing seemingly every night while he looks for a decent combination. With the starters carrying the load, the Blazers have started a decent-enough 5-6, but they can’t keep up the minutes for the whole year I imagine. Jrue Holiday might not even be in the top 10 in usage rate, but it sure seems like it. The Sixers, who are off to a somewhat surprising 7-5 start without Andrew Bynum, have given Holiday almost all play-making responsibility. He has responded by putting 8.6 assists per game, while also leading the league in turnovers and playing over 38 minutes per game. Holiday, who never had anything resembling this much usage, has responded rather well. The turnovers are concerning though – even if he’s gotten better recently. The Sixers’ season might not be a waste if Holiday performs at a near all-star level. I’m not saying the Bobcats have a good offense – they rank just 21st in efficiency. But if they can maintain this offensive pace, they’ll exceed pretty much all expectations. Most, if not all, NBA observers expected the Bobcats offense to only be marginally better than it was last year. 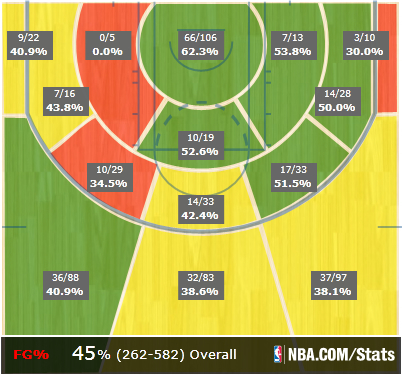 But Kemba Walker has completely transformed his game, and Byron Mullens now shoots threes, and MKG hasn’t been bad. This just in: Chicago misses pretty much everyone it dumped this summer. More than anything, it misses C.J. Watson and Kyle Korver, who actually knew how to shoot the ball and did so regularly. The Bulls average only 12.5 threes attempted per game, which is by far the worst in the league. They also rank 29th in 3FG%, which does not bode well for their prospects. While Derrick Rose will create space upon his eventual return, he might not have anyone to pass it to. Hinrich has been awful. Deng still has a wrist problem, and with his minute load he may disintegrate into dust particles by mid-season. 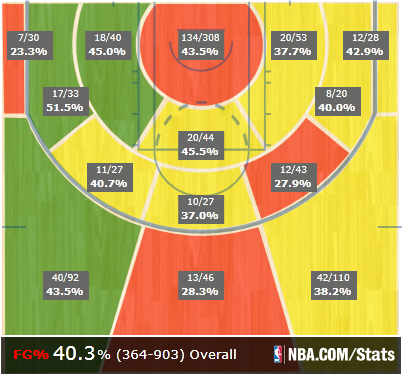 Belinelli is nothing if not consistently meh. And Rip Hamilton might be moved for cap reasons at some point during the season despite maybe being the team’s foremost perimeter threat. In other words: Chicago’s problems won’t be magically solved when Rose returns, especially if he returns at less than 100%. If Hamilton is dealt, that’s another blow. I had HIGH hopes for Smith this year, given his free agent status. So of course, he comes into the season and becomes more Josh Smith-y, with more long jumpers and anemic play. I expected him to stop some of that play, partly because he’ll get paid more and partly because the Hawks suddenly were flush with shooters surrounding him and Horford. He has been nothing short of massively disappointing. Of course, Smith has time to turn it around. But maybe he will just never understand that his long-range shooting kills his team. Maybe he doesn’t realize how good he and his team would become if he just resisted taking even half of the shots he currently takes. Mayo moved to Dallas on what most believed was a below-market deal over the summer. So far, he’s proving most people right. Though Mayo is shooting a fluky 52% on nearly 6 threes per game, he finally is showing the scoring potential that had NBA-types salivating when he came out of high school. Still: if he can maintain an above-average three point conversion rate – and I don’t see why not – he’ll get way more than $4 million on the open market. The Nuggets lead the league in rebounding differential (+8.5 per game), mainly because they are absolutely gunning for offensive rebounds. Kenneth Faried averages 5.5 offensive boards per game alone, which leads the NBA. JaVale McGee and Kosta Koufos combined for nearly 6 from the center position. And they need it too, because their shooting has been so, so bad. You figure Danilo Gallinari and Ty Lawson won’t shoot in the low 20s in three point percentage for the whole season, but if they do, the Nuggets will get a lot of those misses. This just in: NBA teams are shooting more and more threes as time goes along. So far this season, teams are averaging 19.3 threes attempted per game, a full attempt more than last year. 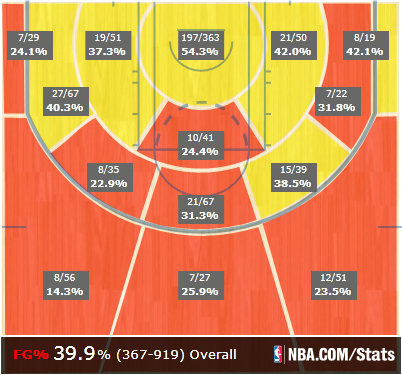 Granted, the lockout may have depressed three point attempts as it did shooting numbers on the whole. New York and Houston lead the way with 27.7 and 26.7 attempts per game, respectively. Last year’s leader, Orlando, is actually one of the worst in the league in attempts this year (with a new coach and no Howard or SVG, that’s to be expected). Most teams are slowly but surely realizing the value of strong shooting to offense as a whole, and this year seems to have a ton of shooting. Ones that are desperate for shooting may have to pay up for the like of J.J. Redick, as it’s suddenly a hot commodity.